Tata nano was known as one of the cheapest car in the world today which worth only for $3,000, but how if this car was coated with 22 carat gold and jewelry? meet this world's most expensive tata nano car which is covered with 80 Kilogram of 22 Carat Gold, 15 Kilogram of Silver and and 10,000 precious and semi precious stones like pearls, emeralds or rubies. Tata Group and Titan Industry -owned Goldplus jewelry chain decided to create the most expensive Tata Nano ever. After covering it with kilograms of gold, silver and jewelry, the price of the world’s cheapest car went from $3,000 to $4.6 million or Approximately £2.9 Million. :D It's really nice effort to make the most expensive version of one of the cheapest car. See also more luxurious car such as this Cadillac CTS Couple covered with Swarowski crystal or even this Golden Ferrari 599. The blinged-out car which was unveiled on last monday by Tata Group Chairman Ratan Tata, at the Tata Theater in Mumbai, will go on a six-month tour, to be displayed in 29 Indian towns where the Indian car manufacturer operates. 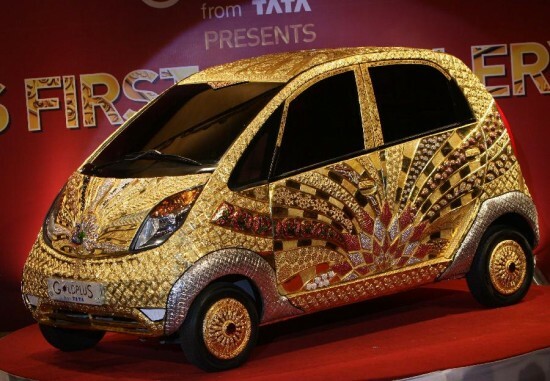 Check the video below when Tata unveil this jewel and gold encrusted tata nano in Mumbai as a tribute to 5.000 Years of Indian Jewelry making.